While New Line Cinema's IT remake managed to salvage a horrid summer box office season, last weekend marked a return to the box office's slumping ways with a slew of underperforming newcomers. As expected though, Warner Bros.' Blade Runner 2049 debuted at just the right time to put the box office back on track, opening in the top spot with a decent $31.5 million. While it still came in far under most box office predictions, it still helped the box office get back on track for what could be a strong fall season. This Blade Runner sequel opened in 4,058 theaters, earning a decent $7,769 per-screen average in the top spot at the box office this weekend. It also earned an additional $50.2 million this weekend, to bring its worldwide opening weekend total to $81.7 million. Still, that figure represents roughly half of its $150 million production budget, and since the project isn't slated to open in China, and it only has two more markets left to open in, South Korea on October 12 and Japan on October 27, its worldwide total may fall short of expectations. Blade Runner 2049 is set thirty years after the events of the first film, following a new blade runner, LAPD Officer K (Ryan Gosling), unearths a long-buried secret that has the potential to plunge what's left of society into chaos. K's discovery leads him on a quest to find Rick Deckard (Harrison Ford), a former LAPD blade runner who has been missing for 30 years. 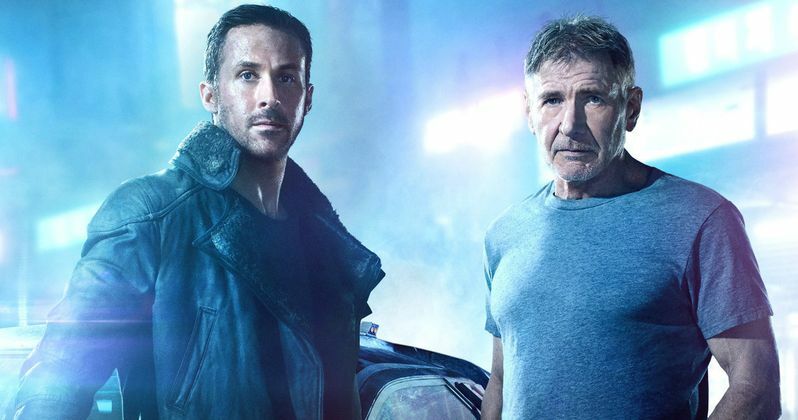 Ryan Gosling and Harrison Ford lead a diverse cast that also includes Ana de Armas, Sylvia Hoeks, Robin Wright, Mackenzie Davis, Carla Juri, Lennie James, with Dave Bautista and Jared Leto. Acclaimed filmmaker Denis Villeneuve (Arrival, Prisoners) directs from a script by original Blade Runner writer Hampton Fancher and Michael Green, with Ridley Scott producing. Opening in second place this weekend was The Mountain Between Us which earned an estimated $10.1 million, debuting in 3,088 theaters for a middling $3,271 per-screen average. Stranded after a tragic plane crash, two strangers must forge a connection to survive the extreme elements of a remote snow covered mountain. When they realize help is not coming, they embark on a perilous journey across hundreds of miles of wilderness, pushing one another to endure and discovering strength they never knew possible. The film is directed by Academy Award nominee Hany Abu-Assad and stars Academy Award winner Kate Winslet and Golden Globe winner Idris Elba. The top 10 is rounded out by IT ($9.6 million), My Little Pony: The Movie ($8.8 million), Kingsman: The Golden Circle ($8.1 million), American Made ($8 million), The LEGO Ninjago Movie ($6.7 million), Victoria & Abdul ($4.1 million), Flatliners ($3.8 million) and Battle of the Sexes ($2.4 million). Also arriving in limited release are Purdie Distribution's The Stray, which earned $550,000 from 640 theaters for an abysmal $859 per-screen average, and A24's The Florida Project, which earned $153,342 from just four theaters for an impressive $38,336 per-screen average. No box office data was released for Vertical Entertainment's 2307: Winter's Dream, Dada Films' Architects of Denial, Parade Deck Films' Bad Grandmas, Well Go USA's Better Watch Out and City of Rock, Hanover House's Daisy Winters, BBC Worldwide North America's Earth: One Amazing Day , Freestyle Releasing's Generational Sins, Film Movement's Paradise, Good Deed's So B. It, and Eammon Films' Una.